What's up with these names?? Saw a story from last Friday out of New Zealand about one of those odd names that actually was rejected by a court of law! A married couple who was apparently born without pride, dignity, or basic common sense named their daughter "Talula Does the Hula from Hawaii." A Family Court judge in New Zealand made the nine-year-old girl (who was so embarrassed by her name that she told people to call her "K") a ward of the courts in order to change her name after a lengthy custody battle. As a result, her name was changed to "My Name Was Legally Changed in Court." No, I'm kidding; the paper did not list her new name. She'll never have to try to squeeze that long name onto a Best Buy employee badge. When she marries a guy named Chad whose last name is Johnson Rides the Wave Boo Yah! her name will merely be long instead of ludicrously long. Her hand will be less likely to cramp when signing autographs as a former child celebrity. My question is, why aren't there more judges like this New Zealander??? We've got plenty of whacked out names here in the states! Why doesn't anyone else in a position of legal authority seemed to recognize "the very poor judgment which this child's parents have shown in choosing this name." On Thursday morning, my friend Chris and I thought the shuttle over to a convention center and headed back onto the exhibition floor. As opposed to the intimate gathering from the night before, this time we ran into roughly 150,000 fellow convention goers. Upon entering the door and looking to my right, I was greeted to the site of my very first celebrity -- Lou Forigno! No way that guy ever took steroids! I made it my goal that day to take a lot of pictures of people walking around in costumes, but more importantly, to take a lot of pictures of me WITH people in costumes. And then some true celebrities! 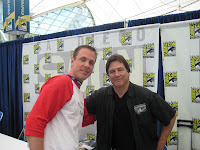 After sitting in on a panel discussion led by Richard Hatch of Battlestar Galactica, I got to meet him upstairs! 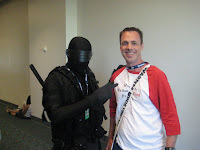 Later on, I got to meet another television personality, The Defuser! For anyone who is unfamiliar with this guy, he is the winner of last season's reality show Who Wants to Be a Superhero? As dorky as it sounds, the guy seemed pretty cool, and since he is the guy I had been rooting for, I enjoyed meeting him. Tomorrow: Day three -- also known as The Day My Camera Died. 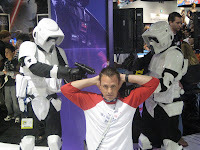 Storm troopers tattling on Spiderman? I am finally back in Texas after my whirlwind tour of both coasts. I can't say that the 100 plus degree weather is exactly a welcome thing. First off, let me direct everyone's attention toward this week's Mr. Teacher column on education.com, which was written with the help a lot of other teachers. Thank you to everyone who responded to my post from a couple of weeks ago asking about how you handled tattling. The column this week is a nice mash up of everyone's strategies and techniques. Definitely some things to try there. Now let's get to the good stuff! 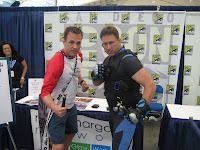 I had a BLAST in San Diego at this year's Comic-Con! My buddy and I got up real early on Wednesday morning to get to the airport for our flight. The good folks at the security terminal saw fit to confiscate a couple of the items from my toiletries kit, and that put me in a bit of a foul mood. The containers that my shaving gel and hair gel were in were too large to be allowed through the terminal, so I had to relinquish them. When I asked why, the girl said, "It could be a bomb." I had to bite back a few replies to that one. The first was, "You mean DA BOMB! As in, that hair gel makes me DA BOMB all up in here!" My second unstated reply was to question why they think that terrorists are incapable of bringing liquids through in tiny containers and mixing them together. 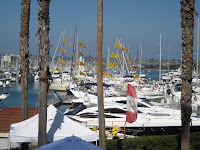 We landed in San Diego, and the weather was fantastic. When we left Dallas, the temperature was 102°. In California, we stepped out to 71°. Ask any of my kids, and they would tell you that was a temperature difference of 173°! Wednesday night was the "preview night" for the Comic-Con, so we got to check out the exhibit floor a little earlier than some people. It was just my buddy and me and about 20,000 of our closest friends. We walked the exhibit floor and saw hundreds and hundreds of booths and displays. There were comic books, there were movies, there were spaceships, there were people in costume. It was fantastic. 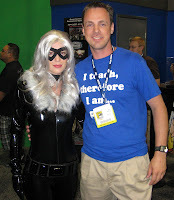 I got to meet the Black Cat. 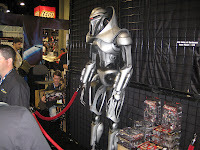 I got to see a Cylon! I got to meet The Cheerleader (well sort of, anyway). Tomorrow, I'll write about Day 2! I'm off for another week of vacation, this time to California! Wish me luck that I will get to see some of the stars and directors of my favorite TV shows and movies. Speaking of, I saw The Dark Knight last night, and it was spectacular! The whole movie was great, but wait until you see Two Face! Awesome! A couple of links: last week's Mr. Teacher column on education.com was about ideas to keep kids from being bored over the summer. This week's column, out today, is all about my experiences filming the game show Whatta Ya Think? Have a great week, and I'll be back soon! Hey everyone, did you miss me? I just got back home from a week in Destin, Florida, and I am roughly the color of a penny. A penny that someone has scribbled on with a red magic marker, that is. Don't worry, I used 15 tubes of SPF 50 sunscreen, so I'm really not burned. Too badly. We had a blast. I went with my family, which means my mom, my dad, my brother, my sister-in-law, and their two kids, aged 1 and 3. We drove both ways in a large rented van, and it took us about 15 hours each way. That part was not so great. Not that anything was miserable or anything, it just really takes a toll on us old people with bad backs. When we got to the condo that we were going to be staying at late on Saturday night, it didn't quite live up to our expectations, to say the least. What had been billed as a luxurious, three level beach house turned out to be unfinished, to put it nicely. From the parking lot, the entrance level and the bedrooms upstairs were decent, though there were a couple of holes in the dry wall, exposing pipes. What was really odd though was that the lower level could only be accessed by exiting through the beach-side door of the entrance level, going down some unlit stairs, and unlocking the outside door. Having done that, the lower-level turned out to be more of a bunker with beds than anything. Unfinished concrete walls, no blinds over the windows, no television set, and one lightswitch on the opposite side of the room from the doorway. Plus, did I mention that there was no connecting stairs on the inside of the condo between the entrance level and the lower level ?? Bizarre!!! My mom decided to call and complain, seeing as this is not at all what she had signed up for, and due to her efforts, we were majorly upgraded. The place we wound up staying at looked like a posh New York penthouse apartment. I even had my own loft with bed and bathroom. It was SWEEEEEET! We spent a lot of time down the beach in the Florida sun, working on our tans. Except for the one-year-old, who has red hair, blue eyes, and makes my pale skin look positively swarthy. My three-year-old nephew, on the other hand, found several kids to play with throughout the week, and he regaled them with his knowledge of Star Wars. On that topic, he also went on several "Wookiee hunts." The Destin surf was loaded with algae, and on some days, being out in the water was like swimming through extra-pupy orange juice. We told Ethan that the large pieces of algae were clumps of Wookie hair, and he went out and grabbed several as they came close to the shore. Also, the first day I shaved (OK, the ONLY day I shaved), I noticed that my upstairs sink was clogged up, so I cleaned it out and discovered several very large clumps of hair. I disposed of them immediately, but later, I told my nephew that I had found Wookie hair upstairs, and every day thereafter, Ethan would ask me if we could go look for Wookies upstairs. As a red-blooded American male, I certainly enjoyed being in a locale where almost all of the women walked around in bikinis. The unfortunate part of this was that most of them were below the age of 18, and the feeling of being a leering old man heavily tempered the frequent head turns and eye pops. Oh, there were also several incredibly good-looking moms there. Of course, there didn't seem to be too many single girls my age, and of the handful that I saw, they weren't really my type. Oh well, I was never really one for the Grease-promoted summer romance, anyway. All in all, it was one heck of a vacation. Now I get to relax for a couple of days, and then turn right around on Wednesday morning and hop a plane for San Diego, California. Comic-Con awaits!!! I would like to ask for a favor, though it should be a rather simple favor to carry out. I have discovered recently that if you request a book at the library and they don't have it in stock, they will often order a copy to get it to you. So I would like to ask everyone who has a card at their local library to request a copy of my book, Learn Me Good. It doesn't cost you anything, but it really helps me out by getting more copies out there for the reading public. Plus, if you haven't read it yet, then you can get it through the library! What to do about tattling? Attention all teachers! I am once again calling for your assistance on a future education.com column. I appreciate all of the responses that I got for the "What are you doing this summer?" prompt, and I hope the response is just as good this time around. This time, I'd like to know how do you handle kids who tattle? I mean, face it, you can't be a teacher and NOT constantly deal with those kids who feel a mighty sense of justice for everyone except themselves. So what strategies or techniques do you employ to deal with these tattle tales? Feel free to leave a comment here, or send me an e-mail at learnmegood2@yahoo.com with the subject "Tattle Tales." In other news, The Scholastic Scribe has included me today on her Take Another Look Thursday post. If the word Zork means anything to you, then my flashback post will bring back good memories for you. Mamacita has put together an excellent Carnival of Education this week, including a fabulous "scolding" of the myriad of entries from people trying to sell essays and research papers. If you've ever hosted a Carnival, then you know exactly the type of people I'm talking about. Check out the Carnival, and be sure to look around at all of the fantastic entries. Over on YouTube, I've posted a mini-commercial for my new T-shirt shop. Check it out, and feel free to pass the link on to your friends! A post from a couple of months ago at So You Want to Teach? got me started down the path towards writing this week's Mr. Teacher column on education.com. On it, a certain Mr. Frap made a comment to the effect of saying that teachers should consider themselves lucky that they don't work in the business world, because they are basically working a part-time job for full-time wages. OK, if you're a teacher, your blood is already probably starting to boil. Anyway, my column this week tackles a couple of simple myths and mistakes about teachers that seem to be commonly held by non-teachers. I saw a story in the paper today that said that Webster's dictionary had just added over 100 new words to their current edition. These words included "Texas hold 'em," "pretexting," and "popunder." This gave me the idea for this week's INTERACTIVE MONDAY! What is a word that YOU would like to see added to Webster's dictionary? I think my word would be "repiteaching." To repiteaching is to explain a concept or to go over an answer multiple times with your class, as a result of them not listening to you the first couple of times. I found myself repiteaching quite frequently this year. OK, YOUR turn! Send in those brand new words you'd like to see published in next year's edition of Webster's dictionary. One of my very good friends is quite the thespian (she still likes guys). This summer, she is going to be appearing in the role of Mrs. Potts in the stage play Beauty and the Beast. I am posting that here because I know that a lot of people who read this blog are in the Northern Virginia/DC area, and that's where this play will be put on. Hopefully, if you DO live nearby (or if you plan on being in the area later this month), you will take a night and go and see her perform. Stacy, my friend, could very easily have appeared on American Idol, but who in their right mind would REALLY want to deal with Simon Cowell? She's got a wonderful singing voice, great stage presence, and brilliant comedic timing. And quite frankly, she's a heck of a lot better looking than Angela Lansbury (my apologies to any Murder, She Wrote fans out there). Anyway, for those of you who are interested, here is the info for the show. Take special note of the "Friends of Mrs. Potts" discount and times. After all, if you're a friend of Mister Teacher, then you're a friend of Mrs. Potts. Go to: http://www.thealliancetheatre.org/ for ticket information and more. The ticket section of the site is very detailed and should answer most questions for you. The theater people have set up a special discount for "Friends of Mrs. Potts!" This special discount is for ONLY the Thursday and Friday night performances. Normally in order to get the $2 discount, you have to have a minimum of 10 people in your group. This is still true for all shows including Saturday and Sunday; however, if you are a Friend of Mrs. Potts, you get the discount on the Thursday and Friday night shows no matter how many people are in your group. If you want the Friends of Mrs. Potts discount, then call the phone number for tickets (703-834-0200). You won't get this discount with the online ticket system. Show Dates, Times, and Ticket Prices - Only 2 weekends and 7 performances! July 25 (Friday) 7:30pm - Children (under 12) $12 and Adults $16. Friends of Mrs. Potts Discount Children $10 and Adults $14! July 31 (Thursday) 7:30pm - Children (under 12) $12 and Adults $16. Friends of Mrs. Potts Discount Children $10 and Adults $14! Aug. 1 (Friday) 7:30pm - Children (under 12) $12 and Adults $16. Friends of Mrs. Potts Discount Children $10 and Adults $14! If you think you want to come, but aren't sure, then pick a night, call the phone number, and reserve your tickets as Will Call. That means that you pay at the box office (cash or check only). You need to make sure that you are there to get your tickets 15 minutes before show time or they will sell them to the public. But if you're not sure if you can make it or you want to allow for the possibility of canceling, then do Will Call. That way if you're not there, they'll just sell the tickets with no penalty. If you purchase them ahead of time, then they are non-refundable (which is also ok, as long as you are sure you'll be there). This is Disney's Beauty and Beast. If you loved the movie, then you'll LOVE our show! It runs at a family-friendly 2 hours with intermission. The Broadway version is longer. There will be fun interactive toys sold in the lobby before the show. Since there are 50 kids and 40 adults in the show and over 100 crew volunteers, it's a grand, spectacular, and creative production with heart. This group involves kids ages 7 through high school primarily and a core group of adults who get the lead roles. This is one of the ONLY groups in the area where entire families can perform and be involved in the show together. The director and crew do their best to find special roles for all of the kids. For example, the rose is a lovely little ballet dancer. In the Gaston scene in the tavern, kids are mounted deer heads on the walls. In the castle, kids are portraits on the walls and palace guards. If you saw CATS last year, then you know what fun to expect with Beauty and the Beast! The Carnival of Education is running this week at An Aspiring Educator's Blog. There are plenty of great, informational entries to occupy your time for the next week or so. So go check it out! I have been using CafePress for sometime now, and I have liked it. However, I have heard two complaints from people that might otherwise be interested in buying a T-shirt. One is that they are a bit too pricey. The other is that there are not more color choices. Well now I've found a solution to both problems. I discovered a new site called Spreadshirt, and I have transferred most of my sayings (plus a few new ones) over to the NEW Mister Teacher's Store! 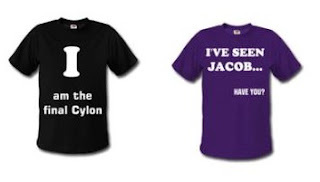 Most of the designs are teacher-related, but there are a few dedicated to popular TV shows. I really hope that you'll check it out, pass it on to all of your colleagues, and hopefully buy a few shirts! Instead of being a COMPLETE bum this summer and doing absolutely nothing except lying around on my couch, I did a little math tutoring. My sister-in-law told me there was a program going on at my old high school, so I jumped at the opportunity to show off my math skills and make a little money. My experiences are the subject of this week's Mr. Teacher column on education.com. Maybe some of you high school teachers out there can weigh in and tell me if this is what public high school teaching is usually like, or if these kids were just as drained as I was at the end of the school year.